The LG Watch Sport is the brawny and brainy smartwatch that’s able to keep up with all of your gym workouts, and smart enough to make calls and use Google Assistant with or without your phone in tow. At launch it had the best specs of any Google watch so far, we’d only like it better if it had longer battery life and more apps. Update: The LG Watch Sport has been updated to Wear OS but it's increasingly hard to get hold of and has more competition than ever. This review has been updated to reflect these changes. The LG Watch Sport comes ready to play, offering more bells, whistles and watch faces than you can shake a wrist at. At launch it was headlined by Android Wear 2.0, though of course it and most other Android wearables have now been updated to Wear OS. However, the LG Watch Sport still stands out through its stylish design, sporty features and optional LTE connectivity. This may not be enough to turn around flagging interest in smartwatches, though. If you didn’t want a watch before today, this isn’t likely going to change your mind about the product category. No, Wear OS isn’t perfect. Yes, the LG Watch Sport is chunky. It’s especially big next to the slicker LG Watch Style that launched simultaneously. But if you want top-of-the-line fitness and calling features on your wrist, the Sport is the more convincing choice, and a better contender for our best smartwatch list. Let’s get into why that is. 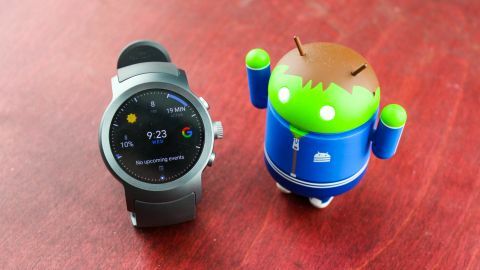 The LG Watch Sport is a relatively expensive smartwatch, as it launched at $349, but since it also has better specs than many – even the more expensive Apple Watch 3 – it’s a reasonable enough value. However, the Watch Sport has dropped in price since launch, as we've seen it from around $265. The real trouble could be actually finding it, as it's no longer widely available in the US, though at the time of writing you can still get it on contact with AT&T via Best Buy. In the UK it's even harder to get hold of, as it never officially launched there. You’re going to want to save up a little more dough beyond the initial price if you want to use LTE. The LG Watch Sport accepts nano SIM cards, enabling you to stay connected even when out of range of your traditional smartphone. In the States, it costs $10 a month to keep the extra line active on AT&T. Verizon charges a $5 monthly fee, while T-Mobile and Sprint aren't compatible with this smartwatch. That’s another – optional – $60 to $120 a year on top of the standard price. Being cutting-edge is always going to cost you when it comes to technology. The good news is that AT&T’s NumberSync feature is free, so you can link your phone’s existing number to the smartwatch number so no one sees your weird new watch number. It measures 45.4 x 51.21mm on the wrist, around the same as the LG Watch Urbane. And while it’s not nearly as slim as either the Urbane or the new LG Watch W7 – rising 14.2mm in the air – its lugs are gracefully contoured. The curved top and bottom lugs make the watch look and feel smaller than it really is, while it doesn’t seem as heavy as its weight of 89g, meaning medium-sized wrists can pull this off. It’s ergonomically designed – just not as much so as the LG Watch Style – where it needs to be, and, first and foremost, it maintains top performance. The underside of the watch stands tall on your wrist so that you won’t have to move it down on your wrist to get a good heart rating reading. Maybe it looks smaller than it really is because of those slimming colors: titanium or dark blue. Neither color comes close to the infinitely more elegant-looking Huawei Watch – but this is a fitness watch, not a luxury timepiece. At the same time, it does a good job of blending into everyday life. It’s something you can wear outside of the gym, too. Having said that, the Huawei Watch GT arguably strikes that balance even better. Our titanium-colored review unit combines a matte stainless steel casing and dark gray watch band. It strikes an attractive two-toned finish whenever the thin, circular bezel catches the light. A large watch like this deserves a sizable buckle to secure it to your wrist. The band is made of the usual Thermoplastic Polyurethane (TPU), so it’s gym-appropriate, and will endure your sweatiest workouts. The TPU here is stiffer and less rubbery than the band found on LG’s first Android Wear watch, the LG G Watch, which had the same type of material. Not only does it feel better against our skin, it cleverly contains watch antennas. That means the watch band isn’t removable, unlike the one on the Mode band-compatible LG Watch Style; again, this watch is about functionality over fashion. What you do get are a microphone and speaker for phone calls, and a hidden SIM card tray to make it all work with or without a phone. We’ll look at its performance in these areas later. Also exclusive to the LG Watch Sport over the Style are two extra physical buttons in addition to the ‘Rotating Side Button’, a less clever name than Apple’s Digital Crown. You can twist away at this knob without covering up the touchscreen with your fingers (and fingerprints), although we instinctively still did that. The two extra side buttons can be programmed, but by default they’re convenient shortcuts to the fitness app and Android Pay. The watch casing is also water-resistant, with its IP68 rating meaning it can survive 1.5 meters (about 5ft) underwater for up to 30 minutes. IP68 makes it more waterproof than the first Apple Watch and LG Watch Style – both at IPX7 – and it ties the Gear S3. But like Samsung's watch, Google advises you not to go swimming with it on. If you want a watch to swim with, consider the Samsung Galaxy Watch or Apple Watch 4 instead. The LG Watch Sport has a beautiful, round screen with a sharp 480 x 480 resolution, better than lots of Android smartwatches and matching the LG Watch Urbane 2nd Edition LTE. It’s the circular 1.38-inch OLED display and always-on mode that really sell this watch, however – it’s the classic-looking face many Apple Watch owners wish they had instead. There are some trade-offs with this, however. You’ll find more usable screen space on boxy watch faces, like that of the Apple Watch, and the always-on display can be a significant battery drain. We let the LG Watch Sport sit idle with the always-on display enabled and, yes, it sucked up less battery life in this craftily dimmed mode. But it drained nearly 2% every hour, and that really adds up – if you don’t put it back on the charger at night you'll start the day at around 80%. Outdoor visibility remains a challenge in direct sunlight, as it does for all watches, although it has an auto-brightness mode (on by default) that goes some way to addressing the problem. The Gorilla Glass 3 protection also helps to reduce unwanted reflections.